We are so excited to offer this revolutionary new technology that can literally Sculpt any area with precision and eliminates fat. truSculpt iD is truly game changing non-invasive RF Fat Reduction technology. So, what makes it so different that the other RF Fat Reduction Treatments? TruSculpt iD is the strongest energy frequency of Radiofrequency for Aesthetic Procedures. This increase in energy Reduce time of the treatment in each area, Reduces the number of treatments needed for an area, and Reduces more fat by penetrating deeper under the skin. We call it the Triple Threat! TruSculpt iD is a safe clinically proven procedure that permanently eliminates stubborn fat cells in the abdomen, flanks, arms, legs, and double chin. In addition to fat reduction, RF energy is proven to tighten the skin. So in one single procedure, you can reduce fat and tighten skin in the area. This procedure is versatile and effective to treat a wide range of patients who may not be a candidate for other contouring procedures due to treatment location, skin type, fat thickness and presence of skin laxity. The great thing about this procedure is there is very little discomfort compared to other RF procedures. Most people would compare it to a hot stone massage. TruSculpt ID allows up to 6 applicators to be used simultaneously. This reduces the time it takes perform the treatment so you are able to treat multiple areas during one short appointment. Depending on the number of areas you are treating, procedures may be divided into more than one appointment. There are several applicator types including the hands-free and a single applicator “hands on” used to treat more precise areas but allow for only one area to be treated at a time. There is also a mini size applicator to use in small tight spaces or over smaller pockets of fat (like under the chin). Each applicator gives the same great fat reduction results. Our expert clinical staff can just offer a precision treatment customized to you by using the different applicators. Depending on your truSculpt iD procedure recommendation you can expect to have between 1-2 sessions. For those wishing for aggressive results on the legs (if a candidate) up to 3 sessions might be required. Similar to any other non-invasive fat reduction treatment that causes fat cells to die, it takes 3 months to get your full results. Typically after 4-6 weeks you will start noticing results which will continue to improve up to three months after treatment. You’ll come back in for follow up photos and assessment of additional treatments after 3 months. There is little to no downtime with TruSculpt ID treatments. Get back to your regular routine right away, you can even work out after this procedure. No one will know you had anything done. You can expect the skin in the areas treated to be slightly pink to red for an hour or two after the treatment. You may experience slight swelling, tenderness or even some firmness for a few days to 2 weeks after the procedure. One area women are always asking to treat are their thighs. Until now, procedures to reduce fat on the entire thigh or improve the appearance of cellulite have provided limited results and required a series of 6 or 8 weekly treatments and not right for many women. With TruSculpt ID, you can see circumferential thigh fat reduction in 1 treatment on the entire front, side, and back of the thighs. Additional treatments may be necessary depending on the thickness of the fat and the amount of reduction you want to see. Additional treatments may also be necessary depending on the severity of the appearance of cellulite. How Does TruSculpt iD compare to CoolSculpting? As Atlanta’s #1 volume CoolSculpting provider, we 100% believe in CoolSculpting and the results we have seen in the last 5 years. 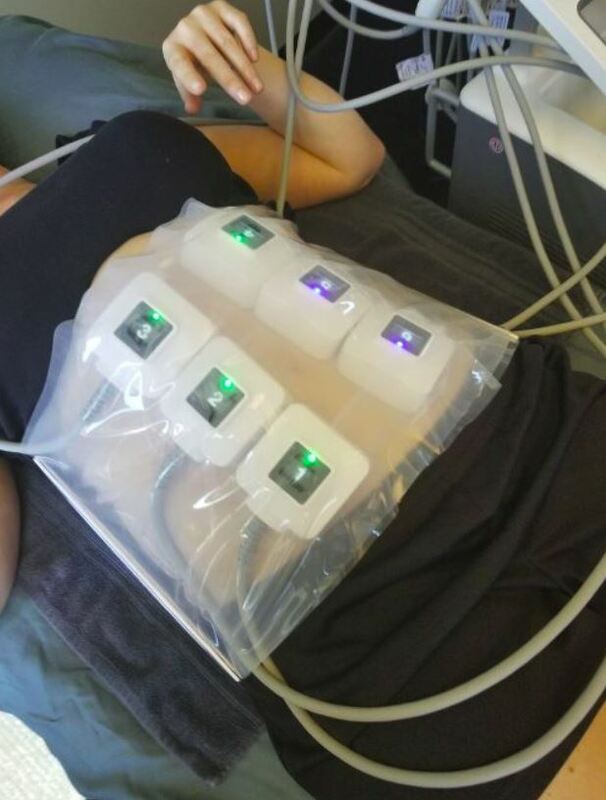 The technology of freezing fat and causing those fat cells in the area to die resulting in fat reduction is proven and effective! 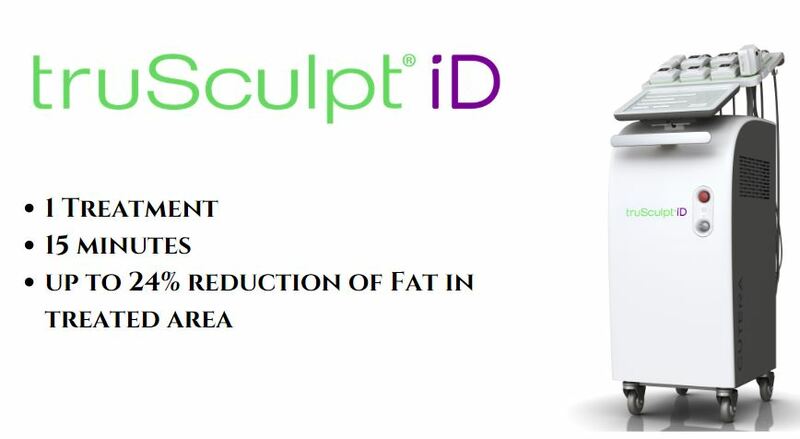 TruSculpt iD is another tool to use in non-invasive fat reduction we now have. 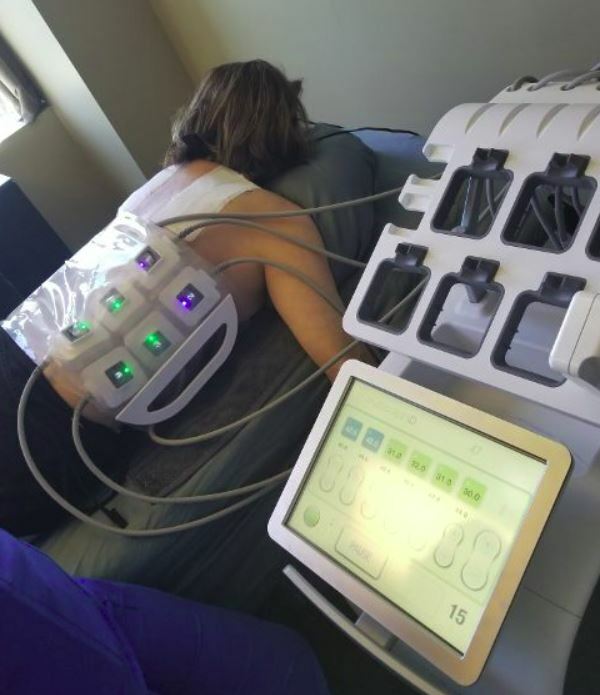 This allows us to treat more people with non-invasive fat reduction procedures than ever before! CoolSculpting is a great procedure, but it’s just not right for everyone. No procedure is! CoolSculpting freezes fat within the fat cells causing them to die and be eliminated by your body over the next 3 months. It does nothing to treat skin laxity and has not been proven to reduce cellulite. TruSculpt has! Many people are interested in non-invasive fat reduction procedures, but because of skin laxity are not the best candidate for CoolSculpting alone. We’ve offered CoolSculpting plus another procedure to tighten the skin in many people. For mild moderate skin laxity and fat, this is a great combination that has provided great results for many people. TruSculpt iD has the option of providing BOTH permanent fat reduction by heating the fat cells until it causes them to die and using proven RadioFrequency energy to also tighten the skin at the same time. For more significant or severe skin laxity, CoolSculpting or TruSculpt iD plus another skin tightening procedure might still be the best option to get the results you want. With severe skin laxity and fat reduction, the best choice might still be a surgical procedure. Only a consultation with one of our expert Aesthetic providers can determine what treatment plan is right for you. Many people have areas of fat on the body that are too small for the CoolSculpting applicators. Especially small pockets of fat on the outer thigh can just be too small for CoolSculpting to treat because the applicator is just too big. The TruSculpt iD applicators are smaller and can be used to treat smaller pockets of fat effectively providing similar results to CoolSculpting, when the pocket of fat is smaller. Until now, we offered another RF fat reduction procedure that required a series of 6-8 weekly treatments. This procedure is painful on the legs and the weekly treatments were something many people just couldn’t fit into their busy lives. TruSculpt iD is a single procedure that can take as little as 15 minutes per area treated. It’s as easy to make this fit into your busy life as CoolSculpting is! Full Thigh Circumferential Reduction and Cellulite Reduction are issues that CoolSculpting doesn’t work all that well on. We’ve done many procedure reducing fat around the thighs. Sometimes we can only partially treat the thighs but not be able to fully treat every part a woman wanted to reduce. For women with a thicker fat layer around the thighs, CoolSculpting could be used and we saw some great results. Each 2 areas take 75 minutes of treatment time and could take 6 hours to fully treat the legs. With TruSculpt iD, the applicators are smaller but we can treat with 6 at the same time and a treatment that takes 15 minutes. We’ve been able to treat the entire thigh on several people in less than 3 hours. With RF energy also tightening skin, TruSculpt iD can also effectively reduce the appearance of cellulite. 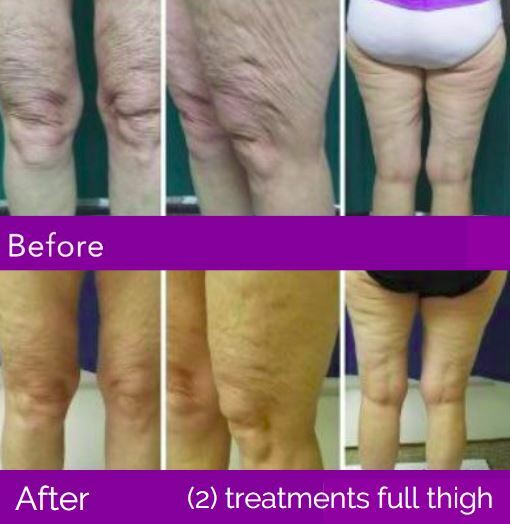 Until now, the best procedure we had to treat cellulite required a series of 6 to 8 weekly treatments and to treat the entire thighs took 5 – 7 hours for EACH treatment! That was a commitment of time that most people just couldn’t make work in their busy lives. With TruSculpt iD, treatment is 1 time with full results and assessment for additional treatments needed in 3 months. CoolSculpting and TruSculpt only treat fat, some cellulite also has a component of the fibrous septae creating divits by pulling down on the skin. This part of cellulite is not treated by reducing the fat, but can improve with fat reduction around this area. Only a consultation by a trained Aesthetic expert provider can determine which procedure or combination of procedures would be right for you. Being able to treat the entire thigh is one area we are most excited to offer at Sculpted Contours Luxury Medical Aesthetics. It’s been one of the most common requests for treatment that we just didn’t have the best solution for until TruSculpt iD! We are currently treating 3 staff members thighs so you can see our results!